A look back at two stellar women whose accomplishments enhanced life in Lemon Grove. In May, 1964 Dr. Amorita Audree Treganza, the pioneering children’s eye doctor, was crowned San Diego’s Woman of the Year in a ceremony held by the President’s Council of Women’s Service Clubs at the Hotel Del Coronado. Honorees were selected for their achievements in business or profession and service to their communities. 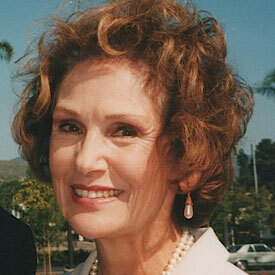 Dr. Treganza began her practice in 1944 in Lemon Grove and later opened a downtown San Diego office. She treated many who could not afford vision care and ultimately limited her practice to children—she remembered the names of more than 4,000 young patients and they remember her. At Christmas and Easter she and her husband, ophthalmologist Dr. Lloyd Adams, took food, toys and medicine to Mexican orphanages and villages. In 1961, for her trans-border work, she was named San Diego’s Goodwill Ambassador by San Diego Mayor Charles Dail. 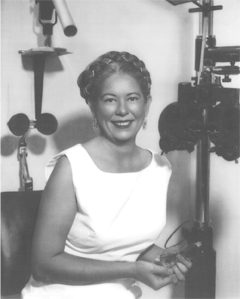 She was the first woman to head a national medical association, the College of Optometrists in Vision Development, which she co-founded to promote research into eye problems, especially among children, hitherto considered untreatable. In Lemon Grove she was the first Miss Lemon Grove in 1928, riding on The Big Lemon (designed by her father, architect Alberto Treganza) on its maiden voyage as a parade float in the July 4 Fiesta de San Diego. 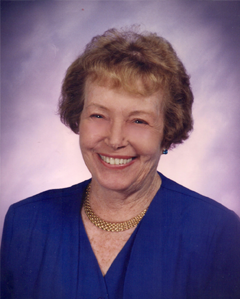 She was a charter member of the Lemon Grove Historical Society and served twice as president. With Tony Sonka and others, she spearheaded an effort to record Lemon Grove’s history, creating a record that is a key part of the LGHS archives today. That record includes extensive material from Soroptimist International of Lemon Grove, which she also served. In 1990 she launched the annual Treganza History Essay Competition for Third Grade in Lemon Grove Schools. LGHS followed up with an eighth grade history essay competition. Both are flourishing today. Dr. Treganza trained Dr. Robert Sanet and Drs. Carl and Melissa Hilliard in her pediatric vision care techniques. Today the Doctors Hilliard run her original optometry office at 7898 Broadway, Lemon Grove, as the San Diego Center for Vision Care. May was always a busy month for Dr. Treganza. In 1964 alone she spoke to the Women’s Society for World Service about her Flying Samaritan activities, flew missions to Mexico, ran her practice and was honorary parade marshall for the Antique Car Parade along Broadway sponsored by the Lemon Grove Chamber of Commerce. When she died on May 5, 2002 in her 90th year, LGHS held a large Celebration of Life at the Parsonage Museum attended by her former theatre colleague Craig Noel, medical colleagues, family and hundreds of area residents. Oh, Amorita, our golden girl, we miss you every day. Dorothy Mattie Nottingham (“Dolly”) was the first president of the Lemon Grove Historical Society, a founding member, and writer of our bylaws and oral history guidelines. 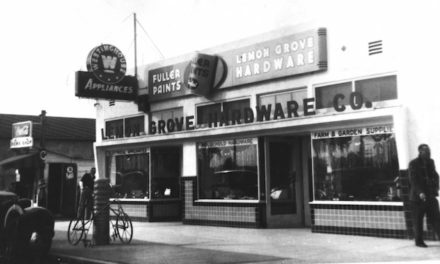 She and her late husband, Harry Lee Nottingham, were a force in the post World War II growth of Lemon Grove. Dolly, in particular, was a petite package of wit, ideas, energy, charm and organizational power. She made every day a good day and, somehow, every day a sunny day in May. Like her older friend, Amorita Treganza (born 1912), Dolly was ready to take on the world, though her path would lead not to a career, but to family, friends and nonstop volunteerism. Born in 1923 in Akron, Ohio in an age that wasn’t ready for women of intelligence and ambition, Dolly knew tragedy early in life. Her mother died of tuberculosis when the little girl was four. She was sent to New Jersey to live with her paternal grandparents on their chicken ranch, where she spent a happy childhood. At age 12, Dolly lost her beloved grandmother, Mattie Gerhardt, and was sent to live with aunts and uncles near Manasquan, New Jersey. Those years, too, were productive amid a loving family that appreciated her quick wit and energy. Upon high school graduation, Dolly won a scholarship to a secretarial college. She could type, take dictation, answer the phone, file and breathe life into sterile offices. Early in the 1940s, with World War II in full swing, she lit out for California, joining the thousands who headed West as part of the war effort. She met the love of her life, handsome Lee Nottingham (1915-1998) of Oregon, and married him in 1949. Lemon Grove lucked out. They purchased land in the little town and Lee built their first home, where they raised two boys, Donald and Henry. When a daughter, Holly, arrived, Lee and Dolly built a larger house on the same land and stayed there for the rest of their lives. Dolly and Lee were synonymous with the can-do spirit of the 1950s. Hardly an issue of The Lemon Grove Review—the weekly chronicle of local life—went by without mention of Dolly doing this, Dolly doing that, Dolly and Lee, Lee and Dolly. Dolly was a leader in the PTA, Red Cross Water Safety Programs, polio vaccination drives, Juniors’ Clubs, Lemon Grove Women’s Club, Boy Scouts and civic improvements. She and Lee led the effort to build Lemon Grove’s first park, Green Spot Park (today, Lemon Grove Park), on Washington Street. They worked tirelessly to persuade the San Diego County Board of Supervisors that the former agricultural town needed parks and a swimming pool for recreational activities, safe streets—and civic incorporation (the latter successful in 1977). There was nothing she wouldn’t do to aid the burgeoning local school district even to garbing PTA members as the Seven Dwarfs and parading through town with tin cups, begging for money. She organized theme parties like the 1920s speak-easy bash with Charleston contests, a French can-can party in which husbands also danced, a Flag Day square dance — and the endless bake and rummage sales. In 1969 the Grossmont School District awarded Dolly a Laurels award for her contributions to education. She earned her AA degree in 1976 and, later, a parliamentary certificate. In 1996 when your correspondent joined the board of the Lemon Grove Historical Society as vice president for Membership—a role held by Dolly in the 1980s— the first stop was Dolly’s house for advice. The historical society was planning to rehabilitate Lemon Grove’s first church, built in 1897, and oversee its adaptive reuse as the Parsonage Museum of Lemon Grove. LGHS had a nest egg of $5,000, but little else. The fundraising plan included raising membership rates. In those days you could join at the $5 student level up to the $100 Life level. The plan called for tripling and quadrupling the rates. Brilliant advice. As usual, Dolly was right. We got the job done with OPM. When the museum opened on Sept. 26, 1999 with a single exhibit titled “The Sweating Beast: Two-Legged and Four-Legged,” Dolly said, “I”m so proud of you.” That was like an accolade from the Pope, Mother Theresa and all the angels. 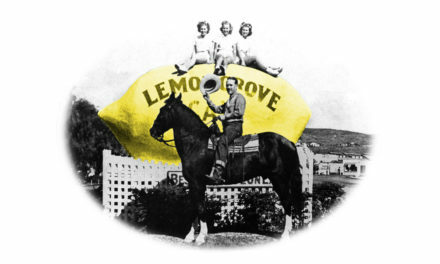 Dolly served Lemon Grove into her late 80s when her health prevented her from carrying on. She was able to stay in her own home until the day her heart stopped beating at age 94. She was memorialized on May 6, 2018. Oh, Dolly, our golden girl, we miss you every day. And so it goes in the first fifth of the 21st century when we feel the clock ticking and the wheel of history turning in the wake of the passing of two of our very own.